The transition from the existing fossil fuel driven energy systems to the sustainable energy systems of the future based on renewable energy needs concerted efforts in capacity building for renewable energy. India’s fossil fuel reserves are limited. The major proportion of the domestic oil consumption is based on imports. Hence the importance of development of alternative energy sources has been recognised by the government. This has resulted in Government support for Nuclear Energy and Renewable Energy. India is one of the few countries that have a dedicated Ministry for the promotion of non-conventional energy (Ministry of Non-Conventional Energy Sources, MNES). As India develops, the energy services would have to significantly increase. In order to mainstream renewables in India’s energy sector it is essential to focus on capacity building. One of the biggest challenges for the India's booming renewable energy industry is getting skilled manpower, says a new report that has urged the government to set up training institutes in every likely solar hub. "Unavailability of appropriately skilled manpower has been identified as one of the most prominent challenges in hiring required personnel," said the survey conducted jointly by the Council for Energy, Environment and Water (CEEW) and the Natural Resources Defence Council (NRDC). In order to effectively make the transition from a fossil fuel driven energy system to the future renewable based energy systems, it is essential for India to focus on building capacity for manpower training, strengthening institutions and building infrastructure. 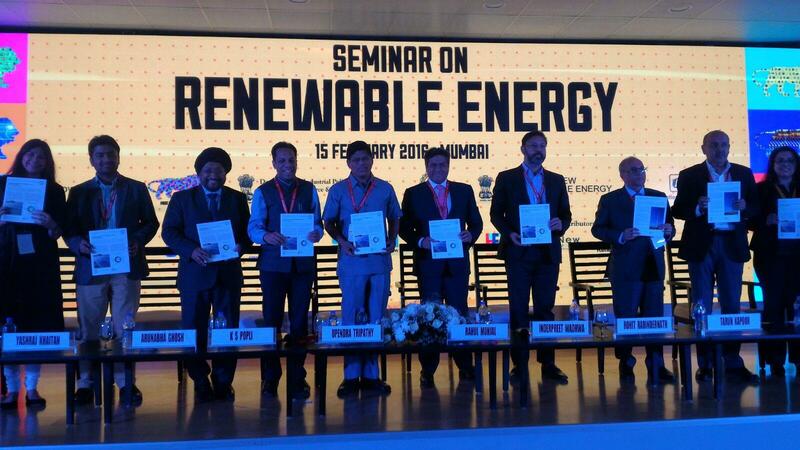 The renewable energy seminar held during the Make in India Week on 15 February was one of the best attended sessions. It served as a platform to discuss and reiterate several initiatives, both domestic and international, that the government is spearheading. These range from the flagship Make in India programme to the establishment of the International Solar Alliance (ISA). However, it is the synergies between these programmes that offer the greatest opportunity, but also need the most attention. Given the population growth rate, India needs to create 10 million new jobs every year. Analysis carried out by the Council on Energy, Environment and Water (CEEW) and the Natural Resources Defense Council (NRDC) estimates that more than 1 million full-time equivalent jobs would be created by the solar deployment industry alone, between now and 2022. These would include over 210,000 skilled plant design and site engineering jobs, 18,000 highly skilled jobs in business development and over 80,000 annual jobs for performance data monitoring. Similarly, the wind sector would create 183,500 jobs by 2022, as wind capacity increases to 60GW. While the job creation potential of the renewable energy sector is significant, it also brings with it the urgent, and currently unmet need for skilling. Analysis based on survey responses from 40 solar companies in India highlights the current unavailability of appropriately skilled manpower for construction and commissioning of solar units as a significant challenge to the solar industry. Similarly, wind sector respondents suggested that the current skilling programmes needed to be made more relevant and accessible, such that companies are assured of the high quality of training. This is where the ambitious renewable energy target of the country interlinks with the Skill India initiative, which aims to skill 400 million people by 2022. It will be crucial to develop standardized training programmes that can be implemented through institutes around the country, with training institutes being set up in areas with the most renewable energy potential and upcoming capacity, as reported by Live Mint. As the country prepares to scale up its renewable energy capacity, it is important to recognize the need for a skilled workforce. A road map for the next 20 years should be prepared detailing out the steps required for manpower requirement in implementing the renewable energy in India.